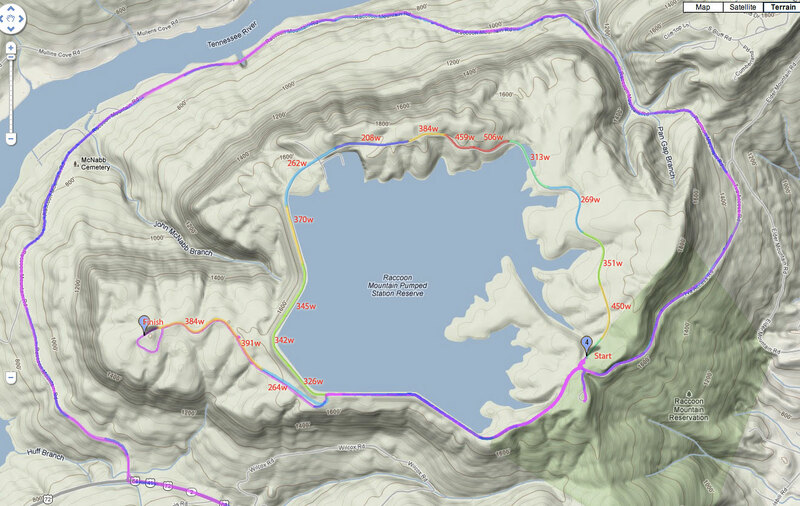 If you are looking for positive happy go lucky race reports, then skip over this one. Time Trial – 46th, 10 seconds slower than last year, disappointing. Criterium – Big crash with no more free laps. Instead of immediately telling us there were no more free laps so that we could chase, the official ushered us over into the pit to tell us to wait until the end of the race so that we could race two additional laps to sort out placings from 28th place on. I don’t think this got communicated to the results people, though, because as far as I can tell none of the people from my group are listed in the results. Very disappointing. Road Race – 7th, best finish ever at this race, but disappointing to cramp so badly on the final climb and not be able to fight for the win. Disappointing. Omnium – 12th. Surprised as my only omnium points came in the road race. I’ve included today’s (Sunday) road race details first. We started at the Covenant Transport Center headquarters about 2 miles down the road from the normal start, so this shortened the race from 62 miles to just under 60 miles. I started at the very back. It took until the righthand turn onto the first hill of the day for me to move about halfway up the large pack. The hill was a bit slower pace than previous years, so everybody was still bunched up. I moved up some on the long gradual descent after the first KOM. When we hit the wider road heading towards the Tennesse River, I was able to move close to the front not too far behind the BMC train as they chased an early 6 or 7 man move that I never even saw get away I was so far back in the pack at the beginning. BMC timed the catch perfectly at the bottom of the Sand Mountain climb. I had slipped a little ways back and started the climb about 20 riders from the front. I chased around a few people who opened gaps and then latched onto a large group led by two BMC riders. I was struggling to maintain a good rhythm but hung on all the way up until the 200 meters to go sign for the KOM. I was really cooked, but fortunately Ryan Sullivan (United Healthcare/706 Project) had also just come off the group, and he and I were able to work together to catch back up to the group (with Ryan doing most of the work as I barely hung on). A few more riders caught up to us before the long descent back down to the Tennessee River making our group about 15-20 riders with all major teams represented. We were not a harmonious group as there was an attack or two across the top of the mountain, and even one attack at the top of the descent. I covered that one and made it back down to the Tennessee River just behind John Murphy (Kenda Pro Cycling) and one or two other riders. The others in the group caught back up quickly, and nobody seemed like they wanted to work so I attacked hoping to get things goings – but little did I know what a firestorm of attacks would ensue. 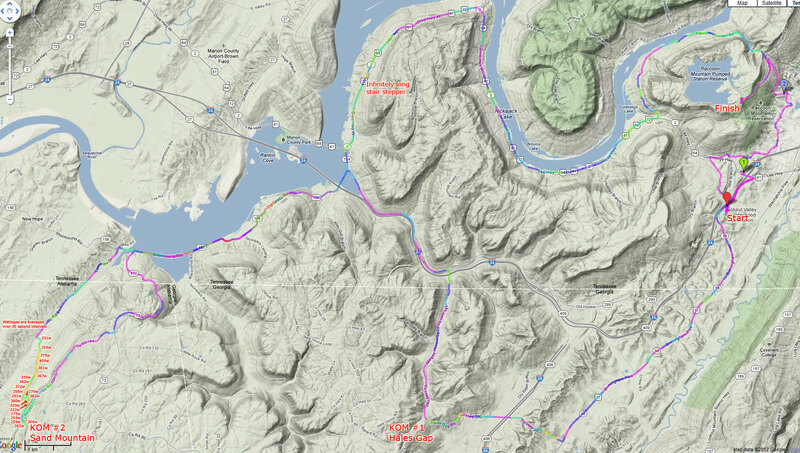 Attack, chase, counter-attack, chase, counter-attack took us into the medium climb up off the Tennessee River. I looked back expecting to see the rest of our group closing fast, but they were gone. At this point, I knew this was the move but I wasn’t sure I would be able to make it over the climb with the group. I dug as deep as I could and made it. There was maybe 7 or 8 of us. The attacking didn’t stop as John Murphy really wanted to get away. This ended up dropping two riders from our group to bring us down to 6 riders. John eventually got away twice. Both times Oscar Clark (UHC/706), Shawn Gravois (Globalbike), Ty Magner (BMC) and I worked together to bring him back, although the first time was before the stair-stepper cat 3 climb and Shawn did most of the work to bring John back. The second time, it was all four of us working together while John’s teammate, Robert Sweeting (Kenda) was able to get the free ride with his teammate up the road. We caught John right before the turn into the TVA area on a gradual hill. Immediately, Oscar put in a hard dig taking Shawn, Ty, and Robert with him – whereas John and I went straight out the back. I had bad cramps in my right leg. These cramps subsided fairly quickly so I hit it hard to catch back up to John and together we chased on the descent (hitting 58mph) back down to the TN river before the final climb up Raccoon Mountain. John joined back up with the other four right as the road pitched up. I, on the other hand, started cramping again so I didn’t catch back on. As the climb steepened, both legs locked up and I had to coast to a stop up the hill, unclip, and wait for the cramps to subside. A few seconds later I was rolling again for another couple minutes. But right as I caught back up to John again, my leg locked up again and I had to coast to a stop again. This time after the cramp subsided, I was able to pick up the pace to catch and pass John. I thought for sure I had 5th place locked up, but 500 meters before the finish Tanner Putt (BMC) caught and passed me. A few seconds later Jake Rytlewski (Astella/ABD) came by, too. Jimmy Schurmann (Globalbike) was closing in fast when I hit the 200 meters to go sign. Fortunately, the grade had lessened enough that I was able to stand up and hit it hard to stay just in front of him to finish 7th. In the group ahead, Oscar took the win, followed by Robert and Ty. Shawn was fourth, although he should some award for all the work he did on the step climb to bring back John the first time. This year’s Pro/1/2 field was one of the best ever at River Gorge, which has always had a strong field. This year there were more than 60 pros and cat 1s plus an additional 30-40 cat 2s. I knew that I had no shot of getting into the top 10 in the time trial for omnium points, so technically it might make more sense for me to soft pedal the time trial to save up for the criterium. But what would be the fun in that? Plus, how could I compare to previous years? 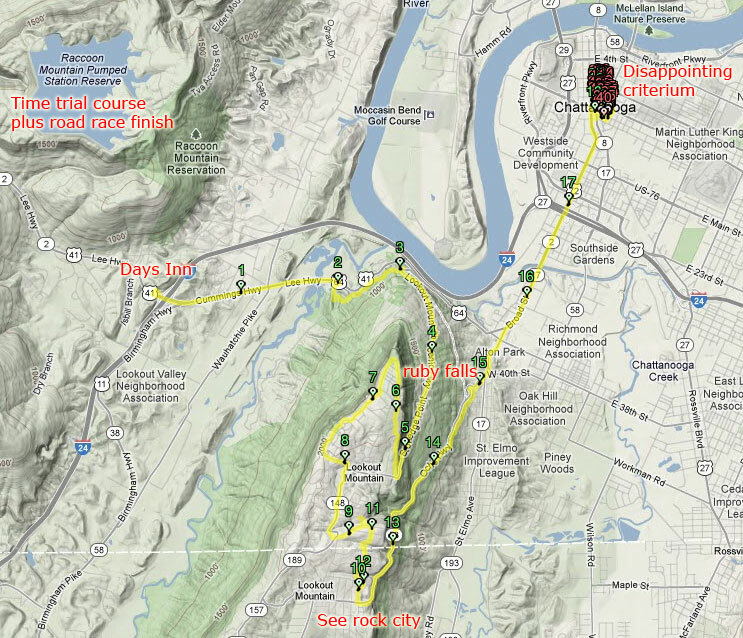 River Gorge time trial power map – click to enlarge. So I got a good warm-up in riding to the start with my teammate Borris. We headed up to the top of Raccoon Mountain via the finishing climb of the road race at a nice easy pace. Packet pick-up, several back and forths across the part of the reservoir dam not being used for the TT course, and it was time for me to go. I started out easier than last year, but then hit it hard on the short climb. My power average ended up being about 5 watts lower than last year (358 watts vs 363 watts), and my speed was about 1/2 mile hour slower (10 seconds slower). Last year I raced Mercx style with no TT equipment, whereas this year I raced with clip-on tt bars, an aero helmet, and a front trispoke wheel. I can’t help but think that the extra baggage slowed me down more than it sped me up. Definitely going to race this time trial Mercx style next year for another comparison. You know what, this race was so disappointing I don’t really want to relive it by writing it up. Instead, I’ll just say that I need to work on paying a little closer attention to when the free laps end before the start of the race. I thought it was 5 to go, but apparently they had announced 8 to go. I got caught up in a crash with 6 to go and thought we had one more lap to get back into the race. I have included the annotated heartrate data below. Annotated heartrate plot. Speed data is spiky from bad satellite signal. Click to enlarge. Warm-up map with all three venues annotated. Click to enlarge. This entry was posted in Racing and tagged criterium, race, road race, time trial on August 26, 2012 by kartoone.